Should political philosophy influence how we view the federal budget? Let us not seek the Republican answer or the Democratic answer but the right answer. Let us not seek to fix the blame for the past—let us accept our own responsibility for the future. On February 18, 1958, at a speech before the Loyola College Alumni Banquet in Baltimore, Maryland, John F. Kennedy called for citizens with different political philosophies to seek common ground and work together to guide the nation into the future. Modern-day political and economic debates are often mired in partisan gridlock, with neither Republicans nor Democrats willing to compromise on the budgetary issues of the day. The growth of political action committees, partisan think tanks, and other ideologically driven organizations has served to further entrench each party’s platform. The parties’ reluctance to give ground is at least predictable. Each has a vision for the nation’s future that fits with its Republican (predominantly conservative) and/or Democrat (predominantly liberal) political philosophy, and those philosophies differ considerably. To what extent do those philosophies influence our thoughts about the federal budget process? How consistent are our political views? Can they change? Should they change and, if so, when? Students are often unprepared to answer these questions. Research shows that adolescent political ideas are not well organized or aligned to a particular political philosophy in a way they are able to express (Hahn, 1996; Hess, 2009). Students have difficulty connecting their ideas to a position on a public policy or a choice for an elected public official. As a result, students are often disengaged from the political process. Yet discussion of important public policy issues requires that participants understand the basis of their own points of view and the basis of the ideas of others. In order to make an informed choice among public policy options, students must be able to monitor their own judgment and test the validity of their instinctive responses. In this lesson, students will learn more about their own political philosophies and then look at some political organizations that seek changes in the budget or the budget process. The students will work to understand the views of these organizations, to position their own beliefs in relation to these organizations, and to locate points of compromise among the diverse opinions. Differing political philosophies are based on real differences of opinion about how the country should be governed. Different points of view about the federal budget often reflect differing political philosophies. Examine sources for information and interpretations, and for cases where they corroborate, complement, or contradict each other. Begin by presenting students with the cartoon “Dance of Democracy” (Resource 1) and asking them to consider its meaning. After students have studied the cartoon for several minutes, ask what they notice, drawing them out on the detail of what they see. If students jump to an interpretation of the cartoon, ask them for the basis of the interpretation and ask other students if they agree or disagree. Who do the elephant and the donkey represent? Who are the onlookers? What can we make of their comments? What point is this artist making about the political parties in the United States? Ask students if they believe the public would generally agree or disagree with the artist’s opinion, and support the range of points of view students express. Online Extension: Use our Overview of the Budget Process animated video as a bell ringer to initiate a classroom discussion on how the federal budget is established, what is influencing decision makers, and what do we need to know. 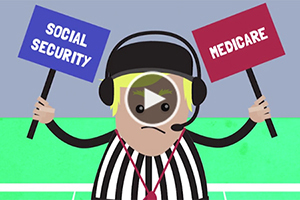 The video presents the basic steps of the federal budgeting process through the metaphor of a football game. You may also wish to distribute the Overview of the Budget Process handout. Begin the lesson by asking students for their general understanding of what it means to be politically conservative or liberal, a Republican or a Democrat. Consider asking them to identify politicians or candidates, the party they represent, and some of the beliefs they espouse. Compile students’ ideas on the board, being careful to explain that not everyone in a political party shares the same beliefs; rather, the party ideology represents a general vision of the role government should play in the lives of its citizens. − Republican Party: Republicans tend to be politically conservative and believe, “We are the party of maximum economic freedom and the prosperity freedom makes possible. Prosperity is the product of self-discipline, work, savings, and investment by individual Americans, but it is not an end in itself. Prosperity provides the means by which individuals and families can maintain their independence from government, raise their children by their own values, practice their faith, and build communities of self-reliant neighbors.” Read more at https://www.gop.com/platform/ . − Democratic Party: Democrats tend to be politically liberal and believe, “. . . wealth and status should not be an entitlement to rule. Democrats recognize that our country and our economy are strongest when they provide opportunity for all Americans—when we grow our country from the bottom up.” Read more at http://www.democrats.org/about/our-party . This portion of the lesson must be done by students online. Inform students that they will take a survey to determine how their political beliefs align with conservative and liberal ideologies. The survey they will be taking was originally administered in 2005 by the Pew Research Center and covers a cross-section of economic, social, and political issues. Explain to students that although the Pew Research Center is a trusted source, its survey is included in this lesson as a reflective tool, not as a way of making a definitive analysis of students’ thinking. Students should use the results of the survey as a starting point for thinking about how their views on specific issues align with like-minded individuals and which of their own views do not fall into that pattern. Direct students to the Pew survey at http://www.people-press.org/typology/quiz/ . Before students begin the survey, ask them to answer the questions thoughtfully and carefully, and explain that their answers to the questions are anonymous. Once the survey is completed, the website codes the results and generates a placement along the political “typology” spectrum according to students’ survey responses. Do your Pew survey results match up with how you think about your ideas? Which questions did you have difficulty answering, and why? Based on your own results, do you think this survey is a good way of finding out more about how you think? Did the survey cause you to think differently about your political philosophy or about any of the topics included? In preparation for tomorrow’s lesson, on the results page, ask students to review how their answers compare to the responses of others on Pew’s national survey, especially in the areas of “Government Performance,” “Social Safety Net,” and “Personal Efficacy.” Specifically, instruct the students to compare their results with other groups in relation to the importance of the federal budget, deficit, and debt. Ask students if they have an opinion about the federal budget deficit and to hypothesize as to which ideological groups might consider the deficit and debt a higher priority and why, based on their responses to the questions in these categories. Begin by providing students with the organizations’ core missions and asking students if they seem to align with conservative or liberal ideologies from the Pew survey they took in the previous exercise. As a class, discuss the mission of each organization and solicit students’ hypotheses about each group’s political ideology. Distribute the graphic organizer (Resource 3) and instruct students to explore their assigned organization’s website in order to determine its opinions about federal budget policy. When the students understand the organization’s position on two or three different issues, they should seek to place this organization on the political typology spectrum, based on what they learned from the Pew survey. If time allows, students could retake the Pew survey from the perspective of the organization they were assigned. Students should then determine whether their initial hypothesis about the organization was correct, providing evidence to support their response. They should also note whether their own political beliefs align with those of the organization they researched. At the conclusion of their research, reassign students to different groups so they can work with students who looked at different organizations. Instruct them to compare the opinions, perspectives, and ideologies of the different organizations they studied, looking for possible points of compromise or agreement among the groups. Lead the class in a discussion guided by the question: Does political philosophy shape advocacy in the area of budget reform? Ask students to share the results of their research with the rest of class, focusing on the way the organizations’ political ideologies are represented in their views about federal budgetary policy. Conclude the class by assigning students a 250-word essay addressing the essential dilemma: Should political philosophy influence how we view the federal budget? Encourage students to consider the ways in which a clearly articulated political philosophy could, on one hand, provide context and grounding to a difficult issue, but on the other hand could narrow one’s point of view and mask legitimate alternatives. CCSS.ELA-Literacy.RI.9-10.1. Cite strong and thorough textual evidence to support analysis of what the text says explicitly as well as inferences drawn from the text. D2.Civ.10.9-12. Analyze the impact and the appropriate roles of personal interests and perspectives on the application of civic virtues, democratic principles, constitutional rights, and human rights. 6.Power, Authority, and Governance. Social studies programs should include experiences that provide for the study of how people create, interact with, and change structures of power, authority, and governance. II.D.What Are the Foundations of the American Political System? What values and principles are basic to American constitutional democracy? III.B.How Does the Government Established by the Constitution Embody the Purposes, Values, and Principles of American Democracy? How is the national government organized and what does it do? Hahn, C. L. (1996). Investigating controversial issues at election time: Political socialization research. Social Education, 60(6), 348–350. To go into greater depth with each organization, students could analyze a budgetary public policy issue from the perspective of each group. Teachers could choose a relevant issue (health care, entitlements, defense spending, etc.) and ask students to determine—or predict based on evidence of the organization’s political philosophies—how the organization would respond to increased spending in this area. Students could then compare the organizations’ “responses” and look for areas of potential compromise among the groups.